Leckhampton is a community to the south of Cheltenham dating back at least 1000 years. The name is formed from the Anglo-Saxon words for vegetables (leek), water meadow (hamm) and settlement (tun). Some local buildings are amongst the oldest in Cheltenham. Much of the large ancient parish was incorporated into the south of the borough of Cheltenham in 1894 and the rest followed in 1992. For more about Leckhampton’s occasionally radical and turbulent history, click here. The Leckhampton ward of Cheltenham Borough. 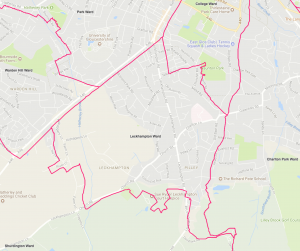 Leckhampton’s Parish Council boundaries are very similar. To the south is the Shurdington ward of Tewkesbury Borough Council. Today’s Leckhampton ward stretches from the Norwood Arms at the junction of the Bath Road, Shurdington Road and Leckhampton Road in the north up to the lower slopes of the Costwold escarpment and Area of Outstanding Natural Beauty at Leckhampton Hill itself in the south. The ward elects two councillors on Cheltenham Borough Council and (along with neighbouring Warden Hill) one county councillor to Gloucestershire County Council. It has its own elected Parish Council, again shared with Warden Hill and on slightly different boundaries. Politically, Leckhampton elections are a tight race between the Liberal Democrats and Conservatives. Martin was elected as the Lib Dem borough councillor in May 2018, just 13 votes ahead of the Conservative who won the ward’s second seat. Our county councillor is Lib Dem Iain Dobie who was also elected only a few percentage points ahead of his Conservative rival. Other parties have never won more than 10% of the vote between them here in recent elections. Find out more about Leckhampton’s local representatives here. The iconic Devil’s Chimney looks down on Leckhampton from the edge of the Cotswold escarpment. Leckhampton is a vibrant community, with many local clubs, societies and campaign groups, three local pubs within the ward and many more close by, a village hall, an outstanding local primary school, nursery, local surgery, vets, scout hut, a surprising variety of local businesses and one international charity, allotments and popular and accessible local green spaces, including an unusual urban nature reserve below Pilley Bridge. Click here for more about local clubs and societies. 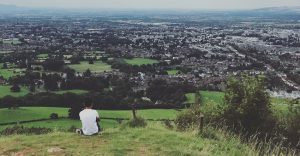 Leckhampton is a lovely, friendly place to live and local neighbourhoods are lucky enough to rank amongst the 10% least deprived in Gloucestershire and in the UK judged by income, employment, health, education, crime and living environment. But it’s important we all remember that not everyone in Leckhampton is wealthy and many local people work hard to make ends meet. Our other challenges include traffic congestion and traffic pollution, the state of local roads, poor public transport, access to popular local schools, managing new developments like the proposed new secondary school and hundreds of new houses and protection of our remaining green spaces from greedy developers planning more high-priced housing on greenfield sites with as little social housing for rent as possible. And, in common with many parts of Cheltenham, the downside of such a high quality of life is a level of house prices that makes the area barely affordable for many young people and families.